The company experience has been gained over a period of 30 years. This was born from a need among industries and ship operations for fast, economic and reliable solutions of problems associated with machinery maintenance and repair. The experience gained by working in the leading forge shops & with crank shaft grinding machine manufacturers helped us to design and manufacture maintenance equipments and processes for diesel engines for use on board, at power plants and in workshops. on board, at power plants and in workshops. We are approved and recommended by major engine manufacturers world wide and we are the market leaders in providing right solutions. Our company's slogan is SINCERITY. We now provide a total package of on site services to give our customers Turnkey solutions to their maintenance and breakdown problems. We work with our customers to help reduce downtime, increase productivity and lower operating costs. Manufacturing, Services, Trading, Importer & Exporter of Maintenance And Repairing Services. Backed by professional ethics, our company is offering an extensive range of Repair, Maintenance and Reconditioning Services that are highly admired by our clients in domestic as well as international markets. We are also specialized in providing solutions for Marine Engines and Diesel Generator. It has been our priority to manage and deliver our services as per the budgetary constraints of our clients and in compliance with the international standards. Well planned and timely executed, our services are rendered by trained and qualified team of technical experts. Manufacturing & Export of Diesel Engine Parts like bearings,cylinder liners,pistons,cylinder valves,guide etc. In addition to this, we also render Audit and Inspection Services for world wide shipping, offshore marine installations, industrial plants and power stations and assist them in sourcing the spares. Marine engine maintenance, diesel engine repairing, maintenance, marine engine repairing, cylinder head repair, piston repair, rehabilitation of cylinder head, rehabilitation of piston, marine engine and diesel cylinder head repair, marine engine and piston repair. Inspection of engine component, magnetic particle, diepenetrant test, non destructive and hardness test, surface finish test of crank shaft, inspection and audit of engine components and parts, certification of parts after repair, diepenetrant test, non destructive and hardness test, surface finish test of crank shaft, complete inspection of main and auxiliary engine, inspection and certification of parts after repair, inspection and certification of parts sourced from ship breaking yards, all non-destructive tests on site. In – situ crank shaft grinding,on site crank shaft repair, on – site crank shaft straightening, on site rehabilitation of crank shaft, marine and diesel engine repair of crank shaft, rebuilding of crank shaft, thermal spraying of crank shaft, in-situ machining, on-site machining, in-situ machining solutions, on-site machining services, erosion – corrosion prevention coating of shafts, plasma spraying of shafts and engine blocks, repair of crack by metal stitching, repair of broken casting, metal stitching of engine block cylinder heads compressor casing, metal locking of cast iron, rebabbitting of engine bearings, white metal lining of generator, white metal lining of engine bearings, bearings with white metal linings, in situ connecting rod repair, connecting rod big end and small end repair, connecting rod serration repair, connecting rod straightness check, connecting rod rehabilitation, inspection of engine component, magnetic particle, diepenetrant test, non destructive test, hardness test, surface finish test of crank shaft, inspection and audit of engine components and parts. Our expertise in the industry also helps us in offering a wide assortment of products that include various components & diesel generator set and marine engines. These products meet the application needs of shipping, offshore marine installations, industrial plants and power stations all across the globe. To provide complete satisfaction to our clients, these products are also customized as per their specifications. complete range of CKD Skoda generator bearings and spares,crankshaft with calibration report and guarantee. Onsite Inspection of Crankshaft for Deflection alignment, Hardness, Magnetic particle Test, Dimensional Check etc. Onsite Line Boring of Engine Block, Correction of Main Journal Housing. Onsite Repair of Cracks by Metal Lock, Metal Stitching Process. Reconditioning of Connecting Rods, Resizing of Big End Bore. For providing our clients with competitive and optimum services, we are assisted by our diligent team of professionals. R A Power Solutions Pvt. 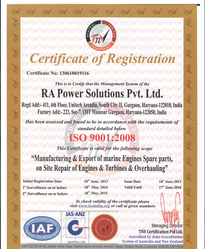 Ltd. is ISO 9001-2008 certified company for “Manufacturing and Exporting of Marine Engines, Spare parts, On-site repairs of engines and turbines overhauling “and has 34 years of experience in supplying marine engines, equipments, auxiliary equipments, spares. A team that works in close association and harmony is a valuable asset for the company. 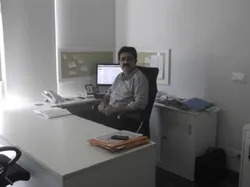 We posses a team of expert engineers and technocrats who have years of industrial experience. Our adroit professionals keep themselves aware with the latest industrial trends and are flexible enough to mould themselves as per the needs of clients. Their focused approach and perseverance has benefited our company invaluably and has fetched wide accolades from our clients worldwide. R A Power Solutions Pvt. 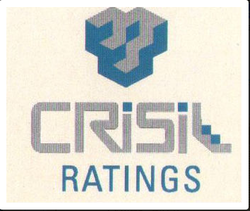 Ltd. holds Trust Seal awarded by CRISIL - A world known rating company. R A Power Solutions Pvt. 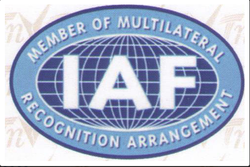 Ltd. is a Member of Multilateral Recognition Arrangement. Owing to our vast experience in the respective domain, we have acquired recognition in Indian and international market for offering reliable services for repair, maintenance, reconditioning, auditing and inspection. Our ethical business operations, flexibility and timely delivery make us a market leader in the concerned sphere. Based on proven methodologies and latest technological advancements, our services are also improvised from time to time in order to meet the demands of diverse cross sections of industries.